Ink or toner is automatically ordered by your printer before you run out. Check to see if your printer is eligible. We know there's never a good time to run out of ink or toner. 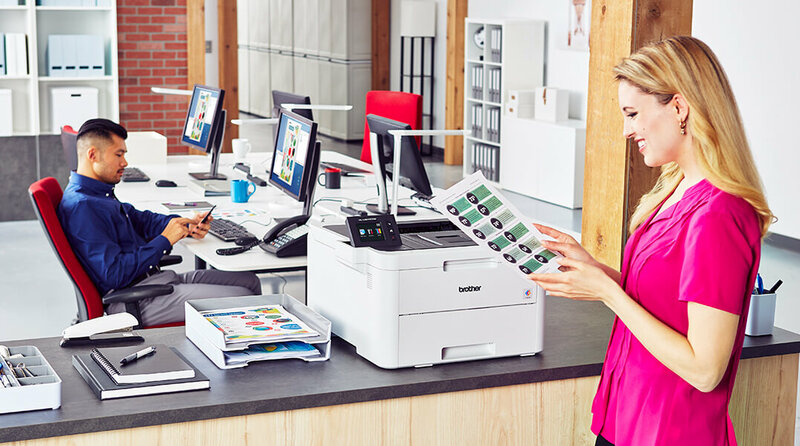 Staples Smart Ordering uses Brother predictive technology to conveniently handle ink and toner needs for your eligible Brother printer. When your ink or toner supply runs low, your printer automatically places a Brother Genuine replacement order so that you don't run out. Get 10% off the cost of ink or toner and FREE shipping on every order placed. It's EASY! Register your Brother printer and enroll it in Staples Smart Ordering. Utilizing smart technology, your Brother printer detects when your ink or toner supply is running low and will generate a Staples Smart Ordering replacement order before you run out. Staples Smart Ordering will ship the correct replacement Brother Genuine ink or toner cartridge directly to your door. Which Brother Printers are compatible with the Staples Smart Ordering program? The following Brother printers are eligible for the Staples Smart Ordering Program. Please note the eligible printer models are subject to change. Please be sure to check this list whenever you wish to enroll a new Brother printer. How do I enroll my Brother printer in the Staples Smart Ordering program? Once you have confirmed that you have an eligible Brother printer from the list provided above, we will guide you through a simple process to register your printer and complete enrollment with Staples. Once enrolled, your Brother printer will begin monitoring your ink or toner usage and will provide information to Staples Smart Ordering when you start to run low. Let's get started! Can I enroll my Brother printer in Staples Smart Ordering if I did not purchase it from Staples or Staples.com? Absolutely. If your Brother printer is on the list of eligible printers provided above, you will be able to enroll in Staples Smart Ordering. Why do I need to create an account with Staples and with Brother? In addition to keeping track of your ink or toner so we can ship your replacements, we sometimes have product updates or program notifications that may impact your Staples Smart Ordering service. We never share your information, and you can select the types of notifications you want to receive. Can I cancel an automatic order for my printer? Yes, you are always in control of your Staples Smart Order activity. You will receive an email notification each time your Brother printer places an ink or toner replacement order. You can choose to cancel any automatic orders by logging in to your Staples account within 24 hours of the order being generated by your printer. If ever needed, you can pause your Staples Smart Order activity from the Staples Smart Order Subscription page.